In Defense They Do What? Could the Octopus Have Evolved? When you think of an octopus, you probably think of its 8 legs with suction cups on each one. But this common sea creature is much more than that. Octopuses (or octopi) belong to the subspecies of mollusks called the cephalopods, meaning head to foot. This is because the octopus’ feet are attached to its head. 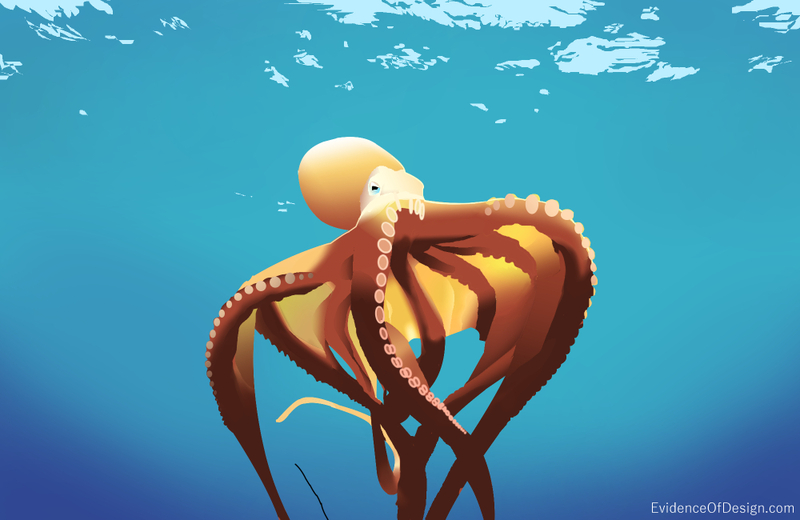 The name ‘octopus’ means 8 feet because, even if the octopus loses one tentacle, it will grow another in a short time. Each tentacle contains a double row of 120 suckers each ranging in size from a pinhead to 2 ½ inches in diameter. With them he can not only grab his prey, but also taste it. The combined grip of these 8 arms exceeds 2000 pounds! The octopus has no bones. The only hard part is the beak. Because of this, a 60 pound octopus can actually work its way through a 2 inch hole to escape. Octopuses live in all oceans. This salt water creature tends to be small in warm tropical waters and larger in colder waters. The largest one ever caught was 600 pounds, the tentacles spanning 33 feet! But usually they range from 50 to 90 pounds. Most only live to be 1 or 2 years old but some big ones live to be 4. The octopus produces a poison in its saliva. It is spit this into a wound inflicted by the beak. This is lethal to crabs, lobsters, and eels but only burns the skin of people. Lunch is then passed by the tentacles to the mouth to be ingested. The octopus has three ways of defense against enemies. First, the octopus has three layers of skin containing a total of 2 million sacs of red, yellow, and blue coloring. An adult octopus can swell selected sacs 60 times their original size making it appear to change color. With this method of camouflage, the octopus can match its surroundings by mixing the colors, even matching stripes and polka dots! The second defense is its ability to produce a black ink. When its worst enemy, the moray eel, comes to attack, the octopus will squirt just the right amount of this ink into the water to feign the size and shape of its body. This ink also temporarily stuns the eel’s ability to smell. While the eel is attacking the ink, the octopus is departing another direction. Its third defense is a jet propulsion system. By shooting water through a funnel shaped opening, the animals is propelled backwards quickly. It is difficult to imagine how an animal like this could evolve such an offensive and defensive set of mechanisms. How could it develop the ability to protect itself by changing color and match its surroundings so perfectly? How would it develop black ink to fool enemies, or the sac where water is stored for the purpose of quick jet propulsion escape? Is not this another marvelous example of God’s creative power? No it’s not, wake up.